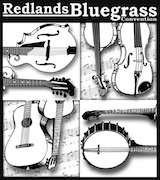 The highly popular Redlands Bluegrass Festival has fans scrambling for their calendars as they move from their traditional July date to August for 2013. A selection of Australia’s top bluegrass bands and artists converge on the 19th annual Redlands Bluegrass Festival at Redland Bay, South East Queensland, from 9 to 11 August. Headlining the festival is Mustered Courage, described by Music Australia Guide as “the link between Bill Monroe and Mumford & Sons” The band has a modern bluegrass sound that has been captivating festival audiences nationwide. New to Redlands is the band Monroe’s Mill which features internet sensation, Pete Denahy, famous for over a million views of his iconic song, Sort Of Dunno Nothin. The popular songwriter also plays fiddle, guitar, mandolin and banjo. Pete was the winner of the Instrumental Golden Guitar at the 2013 Country Music Awards of Australia for his song, Yackandandah, 1852. And joining Pete in the band is another Golden Guitar winner, Paul Wookey. The hilarious Coolgrass are returning to Redlands. They have featured at festivals across Australia, including the National Folk Festival and Port Fairy. One of the most popular and entertaining bands in the country, Coolgrass have a reputation for “bringing the house down” wherever they play. Regarded among the best pickers in NZ, the Pipi Pickers will make their first appearance at Redlands. The band has played many major New Zealand festivals as well as the popular Harrietville Bluegrass Festival in Victoria. Also appearing at the festival will be The Company (QLD), Faux Grass (VIC), Innes Campbell (QLD), Steve Sparrow Band (QLD), The O’Donnells (QLD) and the Redlands Bluegrass Boys (QLD). The concert program runs the entire festival, commencing Friday night, all day Saturday and Sunday. Concertgoers will enjoy an ongoing stream of the best of bluegrass bands in Australia. For those wishing to learn and participate, the workshop series will cater for all skill levels and cover banjo, guitar, mandolin, double bass, harmony singing, band jamming and ukulele. Supporting this will be ongoing informal jam sessions. The festival is well known for its friendly and welcoming atmosphere, catering for beginners through to professional musicians. The venue is Kindilan Outdoor Education Centre, German Church Road, Redland Bay. Accommodation, camping facilities and meals are available on site. For more information and bookings visit www.redlandscountry.asn.au or phone Neil Wills on 07 3206 9226.